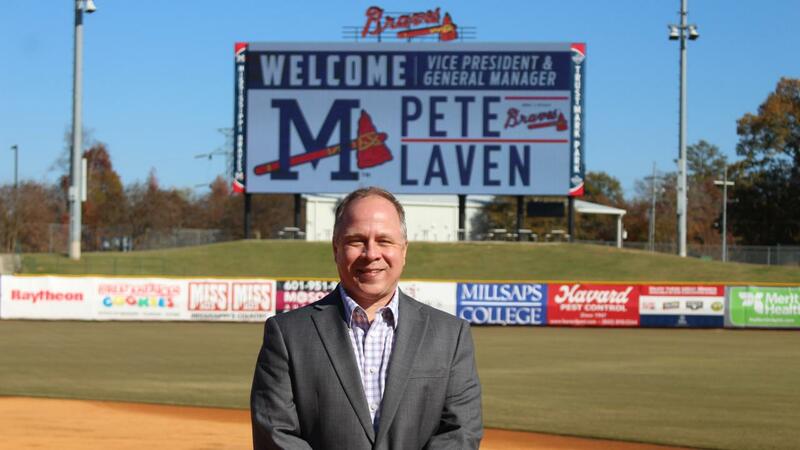 PEARL, MS - The Mississippi Braves, Double-A affiliate of the Atlanta Braves have named 27-year professional baseball veteran Pete Laven as the club's new Vice President and General Manager. Laven joins the Braves after spending the 2018 baseball season as Director of Corporate Partnerships for the Chicago Dogs (American Association). Prior to this past season, he spent five years as President of Salvi Sports Enterprises, overseeing Pat and Lindy Salvi owned franchises made up of the Schaumburg Boomers (Frontier League), Gary SouthShore RailCats (American Association), North Shore Navigators (Futures Collegiate Baseball League) and the Martha's Vineyard Sharks (FCBL). Laven was charged with handling the day-to-day operations of the Boomers since February 2015. Laven was also charged with managing the day-to-day operations of the Boomers as General Manager from 2015-17. Laven spent 13 seasons with the Arkansas Travelers, Double-A Texas League affiliate of the Los Angeles Angels. Following the 2006 season, the Travelers final season at Ray Winder Field, which also featured the Texas League All-Star Game, Laven was recognized as the 2006 Texas League Executive of the Year. In September 2006 he received the first-ever "Closer Award" as the top salesperson in Minor League Baseball. After three years as the club's Assistant General manager (2004-06), Laven was promoted to General Manager by the team's Executive Committee in 2007 and served as the Travs' GM for six seasons. Laven ascended through the organization, beginning as a Stadium Operations Intern in 1992 and returned as the Director of Stadium Operations in 1993. Between two stints in Arkansas, Laven spent one season as Account Executive for the Kane County Cougars (1994), one season as Assistant General Manager for the Albany Polecats (1995) and four seasons as Director of Food and Beverage and Director of Sales with the Piedmont (NC) Boll Weevils (1996-99). His second stint with the Travelers began in 2000, taking on responsibilities such as planning promotions, advertising, ticket sales, and public relations until being named Assistant General Manager in 2004. "I am extremely honored to join the Atlanta Braves organization as General Manager in Pearl," said Laven. "I can't wait to get started working with the Mississippi Braves' talented staff to deliver the best possible fan experience at Trustmark Park in 2019 and beyond." Laven was hired to be Mississippi's second General Manager as the organization enters its 15th season in the Magnolia State following a two-month process led by Atlanta Braves' Executive Vice President of Minor League Affiliates and Strategic Planning Chip Moore. "We are excited to welcome Pete to the Mississippi Braves and into the Braves organization," said Moore. "His leadership skills and industry experience is the right fit to revitalize the Mississippi Braves brand in the greater Jackson region. We look forward to Pete leading the M-Braves for many years to come." A native of LaGrange, Illinois, Laven graduated from Eastern Illinois University in 1991. He and his wife, Holly, have one daughter, Kellan.